Too Faced has an extensive Holiday collection. 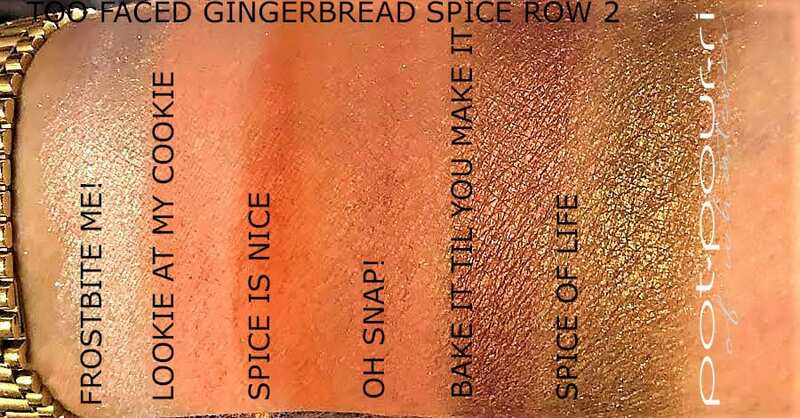 One of my favorites, the Too Faced Gingerbread Spice Eye Shadow Palette, is perfect for the holidays.. First, it has 18 toasty shades. Also, the shadows smell like fresh baked Gingerbread. I think this palette is perfect for the Holiday Season. In addition, the palette is great for the rest of the winter. Above all, the palette has neutral shades with pops of color. Furthermore, the great assortment of colors in the palette allows you to create a lot of different looks. You can find the Too Faced Gingerbread Spice Eye Shadow Palette on Amazon, Ulta and on the Too Faced Website. The Gingerbread Spice Palette retails for $49. 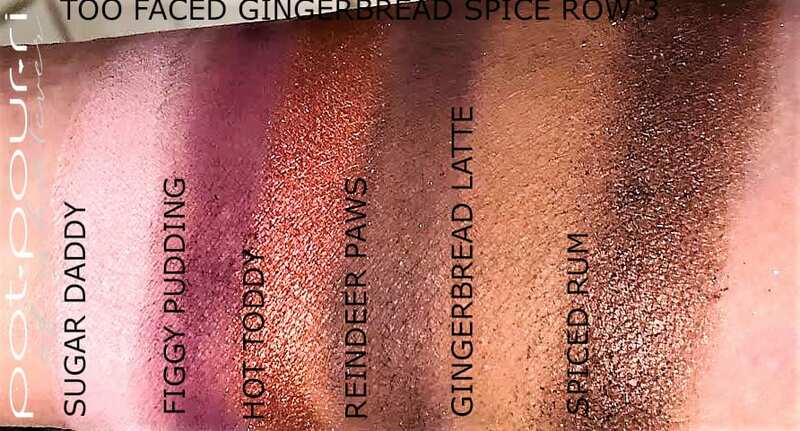 The Gingerbread Spice Eye Shadows come in a tin palette. For example, the tin resembles a tin of cookies. I love the tin’s Gingerbread shade. Also, the Gingerbread Man on the outside of the tin is adorable. He looks scrumptious! In addition, the border of the tin looks like vanilla icing. Also, I love the two hearts, made out of icing, on the cover of the tin . Once opened, the scent of the palette surrounds the palette and you. It is the most delicious, sweet-smelling scent. I think it smells more like cocoa than gingerbread. However, it is a beautiful scent. Inside, there is a nice, big vanity mirror. 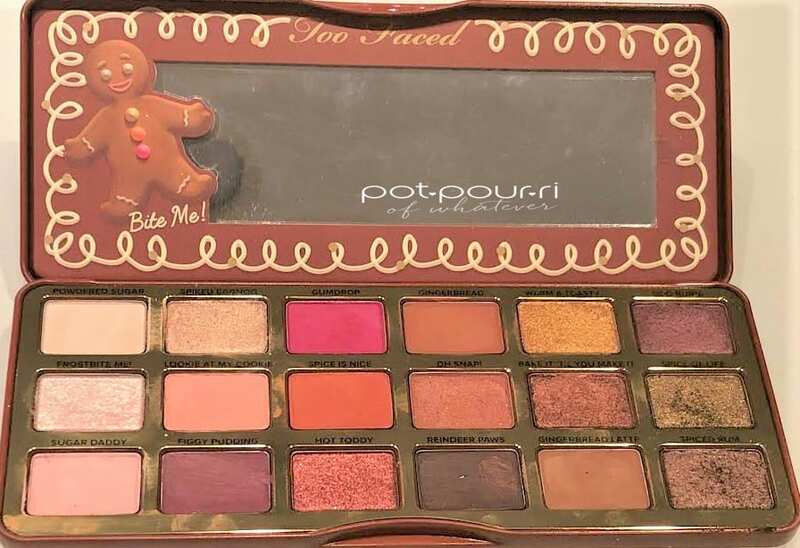 A little gingerbread man greats you with the slogan “bite me!” On the opposite side of the mirror, there are 18 gorgeous, toasty eye shadow shades that look good enough to eat! To begin with, Powdered Sugar is a cream shade with a matte finish. It is the perfect setting shade. Use it on your eye lids before you apply your shadows. Next, Spiked Eggnog is a champagne shade with a satin finish. I would use this shade as a highlighter. Also, I would pop it in the center of my eyelid, on top of another shadow, for more razzle dazzle. Then, Gum Drop is a pink shade with a matte finish. I love Gum Drop in the crease, as a liner on the upper and lower lash lines. Furthermore, it would look great in the corner of the eye. It’s so creamy, you could even wear this as a blush. Gingerbread is a soft, medium brown with a hint of orange undertones. I love Ginger Bread as a crease color. Moreover, Warm and Toast is a golden yellow shade with a metallic finish. Last, Ooo Burn is a deep plum shade with gold sparkles. It is a creamy shade with a metallic finish. Frostbite Me! is an icy silver metallic shade. I love this shade as a highlighter, or as a topper for your eye shadows. Lookie At My Cookie is a pale pink matte shade. Wear this pink matte on your eyelids. Spice is Nice is a burnt orange shade with a matte finish. I love this on the eye lids, in the crease, and on the lower lash line. It’s would make a beautiful blush. Oh Snap is a pinky brown shade with a shimmery finish. I love this shade on the eye lids, or in the crease. Bake It Til You Make It is a copper penny shade with a foiled finish. I love this shade either on the outer part of your eye lid, or in your crease. Last, Spice Of Life is an olive-bronze shade with a metallic finish. It looks amazing as an eye lid shade. Sugar Daddy is a dusty pink shade with a powdery matte finish. I can see wearing this shade as an eye lid base color. Maybe I’d wear it under my brow bone. 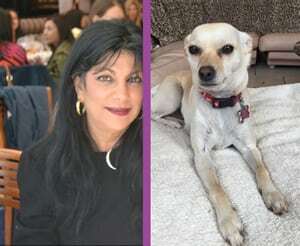 Figgy Pudding is an eggplant shade with a matte finish. I can see a very smoky eye with this shade. Hot Toddy is a cranberry Pink shade with a gold shift in an ultra-metallic finish. Reindeer Paws is a deep brown shade with a matte finish. Love this shade as an eye liner, or in the crease of the eye.
. Finally, Spiced Rum reminds me of cinnamon sugar on toast. It is a deep bronze with sparkle. It looks pretty on the eye lids, or on the outer corner of your eyes. First of all, the shadows are made with 100% natural cocoa powder. As a result, the shadows are scented to smell like gingerbread. Instead, I think they shadows smell sweet like a hot chocolate. Furthermore, most of the shades have rich pigments that make them bold, and vivid. Moreover, the colors blend together. Also, the eye shadows are long lasting. Most of the shades feel creamy. You can use a wet brush, or your fingers to apply the chunkier shimmer shades. Too Faced Gingerbread Spice Eye Shadow Palette Last But Not Least….. I am in love with this palette. First, the neutral shades, and the pops of color, work well in this palette. In addition, there is a fantastic assortment of shades in the palette. And, the colors are super wearable. As a result, you’ll be able to create many different looks. All of the shades in this palette work well together. In addition, I think this palette is what I think of during the holiday season. In fact, this palette is not just for the holidays. It is an amazing winter palette. 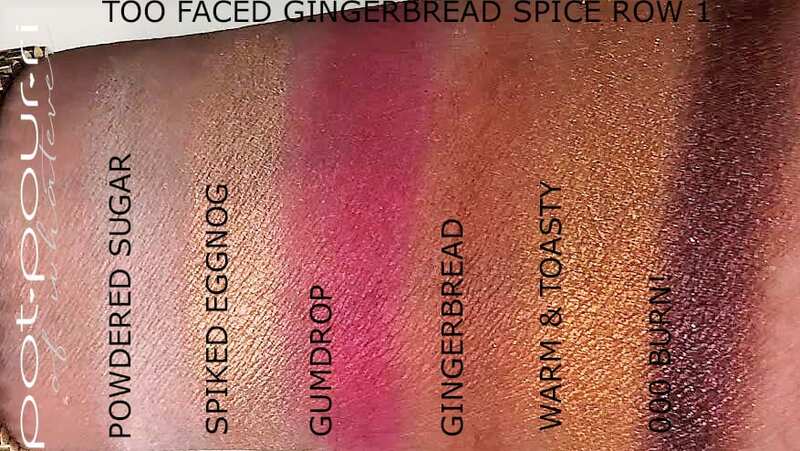 Let me know what your thinking about the Gingerbread Spice Eye Shadow Palette in the comments section below. I love hearing your thoughts. What do you think of when you think of winter palettes?